1. Wash chicken legs and cut into pieces. Cut onion into bite-size pieces. 2. Heat a wok and add 3 T. oil. Stir-fry onion until fragrant. Add the pieces of chicken and stir to mix. Add carrots and ingredients; bring to boil. Turn heat to low and cover; cook for 20 minutes, or until the liquid is reduced to 1/2 cup. Add mixture to thicken; stir. Transfer to a serving plate and serve. Serves 6. When cooking chicken, stir occasionally to prevent it from burning. If the liquid in the chicken mixture has not reduced to 1/2 cup after 20 minutes of cooking, turn heat to high; stir and cook until liquid is reduced to 1/2 cup. wow it looks yummy..can i copy this recipe dae? 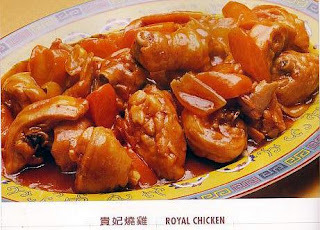 i feel hungry nag tan-aw sa picture ani imong Royal chicken. This chicken looks very good! I've added it to my 'gotta try' list... especially since it's inexpensive to make.